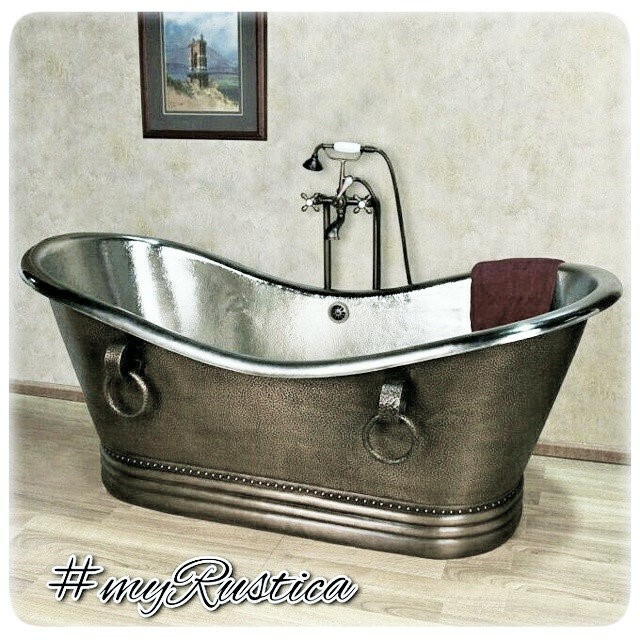 Click the button below to add the Copper Bathtub "Mexican" to your wish list. Mexican copper bathtub is decorated with four rings and hacienda style base. It is a soaking double slipper type with its drain located at the center. Made of recycled hammered copper bathtub '9920' by default is treated with dark coffee patina. Other colors are honey, antique and natural. For creating antique we use light patina washed with dark paint. It makes it vintage looking. All our copper tubs including Mexican copper bathtub can be equipped with the drain back system. This plumbing fixture prevents water spilling over the edge. It takes about four weeks to have it made and delivered from Santa Clara del Cobre, Mexico to the US.